We are passionate about our customers, our employees, and the work we perform. 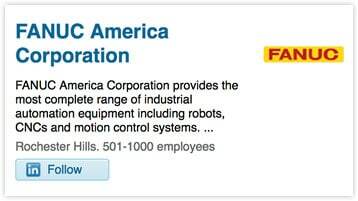 You can learn more about FANUC America - our culture, employees and current job openings - on our robust LinkedIn page. At FANUC America Corporation we are passionate about our customers, our employees, and the work we perform. Through an annual employee survey, our employees consistently tell us that we provide an outstanding workplace. Our goal is to proactively maintain a workplace that individuals continue to be proud of, where talents are embraced, people are heard, and results are encouraged and supported. We invite you to explore our innovative culture, meet a few people, and view opportunities that make FANUC America so special. Our teams consistently deliver results that exceed customer expectations. Our innovative and committed employees drive our shared vision of world-class performance. We are looking for talented people who value integrity, informed decision-making and collaboration. If you believe you are one of those talented people, and are interested in being considered for a career at FANUC America, we invite you to apply for a position today! FANUC America is honored to have been selected as a Top Workplace by both the Chicago Tribune and for the 7th straight year by the Detroit Free Press! We offer market competitive pay and benefits programs, as well as opportunities for advancement, knowledge and skill development, and recognition of individual achievements. FANUC America is an Equal Employment Opportunity Employer. We value the diversity of our people and recruit and hire those who represent our commitments to excellence and to our customers. If you need a reasonable accommodation to access the information provided on this website, please contact the local Human Resource department.